WooCommerce PDF Invoices, Packing Slips, Delivery Notes & Shipping Label plugin delivers a fully customizable PDF invoice that can be viewed or printed on placing a successful order. 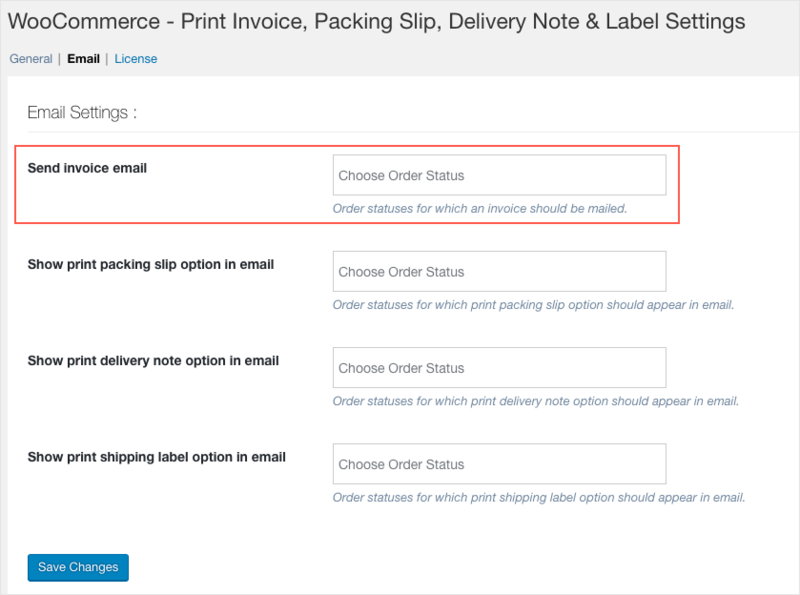 Furthermore, a print invoice option will be enabled in the My Orders page, as well as an email attached with the currently active PDF invoice will be sent to the customer. The pre-requisite to generating and emailing your invoices is to set up an invoice number. The steps detailed below will help you achieve the same. or generate a sequential invoice number that’s independent of the order number. The invoice number can be configured under Invoice/Pack List > Invoice > Settings or you can directly navigate to invoice from the dashboard. 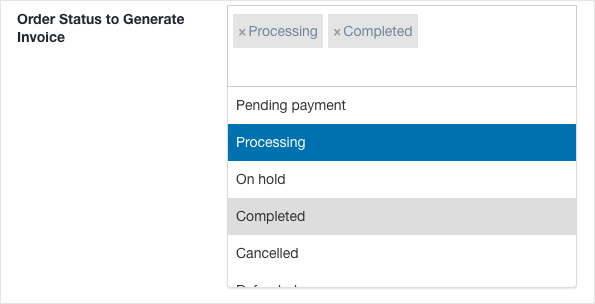 Order Status to Generate Invoice – This option lists all the order status for which invoices should be generated. You can select multiple statuses based on your requirement. The completed status will be selected by default. Invoice Number format – Specify the format in which the invoice has to be generated. For example: [prefix][number][suffix] or only [number] or [prefix][number] as your case maybe.The invoice number will be generated as per the provided format. For example, if the invoice start number is 0001, padding value is 6, prefix value is 170_[d] and postfix value is [Y], the invoice number will be generated as 170_250000092017. Where, value 25 corresponds to current date and value 2017 corresponds to current year. Select the order status from the Sent Invoice Email drop down from General Settings > Email page. This option explicitly identifies for which order statuses the PDF version of the invoice is to be mailed. 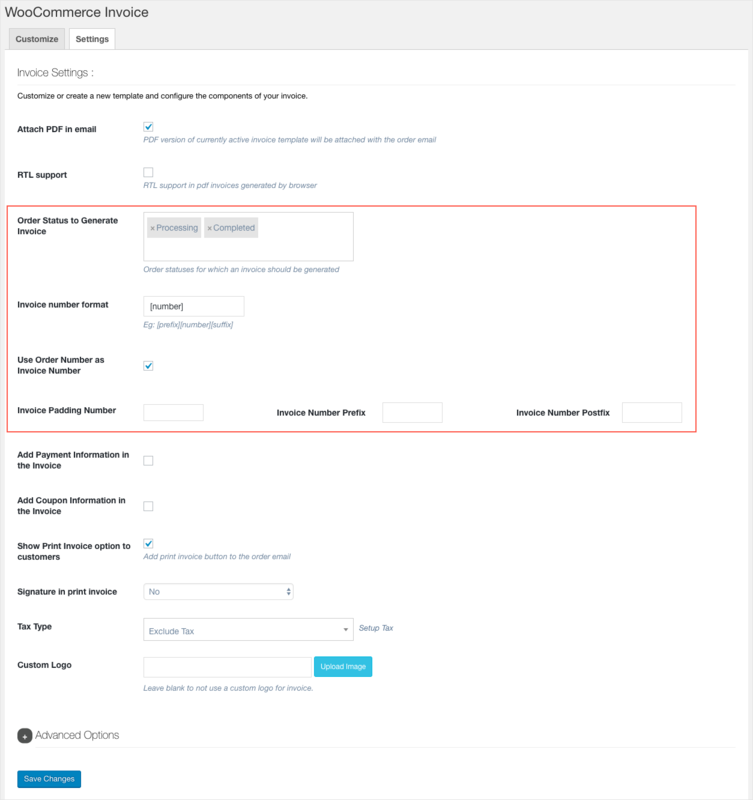 By default, it will take the values from the Order Status to Generate Invoice from Invoice settings as explained above. But you can add additional statuses as per your business needs. Now that all the settings pertaining to invoice generation and email are configured, an invoice number with configured format will be generated and corresponding automated e-mail with an attached invoice will be sent to customers.